Compass Beidou Overview. Global Navigation Satellile System. 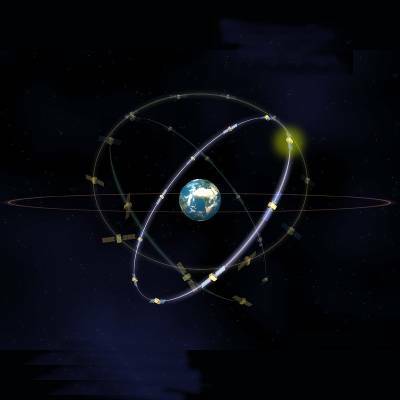 The COMPASS system (also known as Beidou-2) is a project by China to develop an independent satellite navigation system. The current Beidou-1 system (made up of 4 satellites) is experimental and has limited coverage and application. However, with the COMPASS system, China plans to develop a truly global satellite navigation system consisting of 35 satellites. The new system will be a constellation of 35 satellites, which include 5 geostationary orbit (GEO) satellites and 30 medium Earth orbit (MEO) satellites, that will offer complete coverage of the globe. COMPASS will offer 10 services. Five free open services, and five restricted authorized services. These services will be centered at eight (!!) different carrier frequencies. The free service will have a 10 meter location-tracking accuracy, will synchronize clocks with an accuracy of 50 ns, and measure speeds within 0.2 m/s. The authorized (or licensed) service will be more accurate than the free service, can be used for communication, and will supply information about the system status to the users. Two satellites for COMPASS Beidou were launched in early 2007. In the next few years, China plans to continue experimentation and setup system operations. Until 2010 there are 10 Long-March 3 rocket launches planned which should put at least 10 COMPASS satellites into MEO orbit. Like the European Galielo test satellites (Giove-A and Giove-B) the Chinese have also launched a experimental satellite for there Compass system, called Compass-M1. The launch took place on April 14, 2007. Like both Giove satellites the main reasons for launching this satellite is for the frequency filing. Furthermore, the satellite offers an excellent test bed for signal testing and validation. Although little was known about the Compass signal structure independent research has revealed most of its secrets and allowed to build a Compass receiver. It is transmitting in 3 bands: E2, E5B, and E6. The orbit of Compass-M1 is nearly circular has an altitude of 21150km and an inclination of 55.5 degrees. Just like for GPS and Galileo and the future GLONASS the COMPASS GNSS signals are based on the CDMA principle. The singals are highly complex like those of Galileo and the future GPS satellites. The frequencies for Compass are allocated in four bands: E1, E2, E5B, and E6 and overlap with Galileo. The overlapping is convenient from a receiver design point of view but it does raise the issues of inter-system interferences. This holds in particular for the E1 and E2 bands.